Since the creation in 2005 of the company maribé – sors de ce corps, it has produced a series of unique works, where indiscipline reigns with precision and verve. The works, at first glance nonchalant, are the starting point for a deep reflection on human nature and social mores: choreographer Marie Béland asks questions about dance, performance in general, and dance presentations, showing us their inner workings and sometimes their flaws. Her movement vocabulary draws together physical energy, absurd humour, pop culture, and audience involvement, in a juxtaposition of the senses that is as surprising as it is joyful. The company began its activities with maribé – live in Montréal (2005) begun at a residency at Studio 303, followed by a work for teenagers Twis-manivelle (2005), which was chosen by the newspaper ICI as one of the five best works of the year. Subsequent pieces were Espace Vert (2006) Ils seront là à 8 heures (2008) and Les Précédents (2008), and the first works in situ, Dieu ne t’a pas créé juste pour danser (2008), which received the prize ARRIMAGES during its tour of the Maisons de la culture of Montréal, RAYON X : a true decoy story (2010), co-presented by Tangente and le Festival Les Coups de Théâtre, BEHIND : une danse dont vous êtes le héros (2010), that was remounted for the FTA in 2011 and in Paris in 2012, Vie et mort de l’élégance (2012) that won the silver medal at the Jeux de la Francophonie 2013, Nice, France, BLEU – VERT – ROUGE (2013), presented at L’Agora de la danse, Révélations (2014), presented first in Spain and then at Tangente in Montréal in its final version, and finally BETWEEN (2015), presented in double bill with BEHIND at Festival ArtDanThé (FR), at Theatre 140 (BEL) and at l’Agora de la danse. In 2010, Marie also did a two month residency at TanzWerkstatt in Berlin, and in 2012, La Caldera de Barcelone welcomed her as part of the project BCN_MTL, in collaboration with Circuit-Est. Marie Béland and maribé – sors de ce corps receives recurrent support (organization funding) from the Conseil des arts et des lettres of Québec and from the Montréal Arts Council, as well as project funding from the Canada Council for the Arts. Several times, the organization has benefited from residency support from the dance milieu, whether from Agora de la danse (2010 and 2014), Place des Arts (2008 to 2013), the Maisons de la culture of Montréal (2009 to 2014), the FLAK company (2005 to 2009) or the dance department at UQÀM (2005 to 2014). 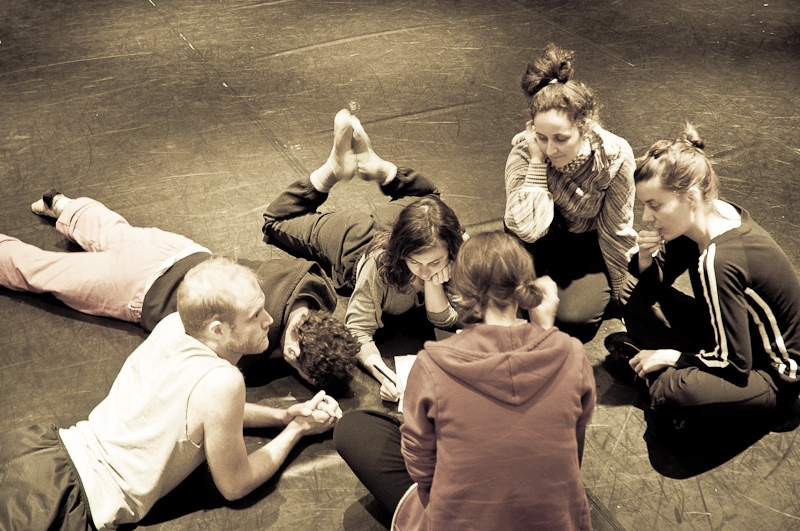 The company is invested in resource sharing by being a member of Circuit-Est centre chorégraphique since 2009 and of Art Circulation since 2013.
maribé – sors de ce corps is also involved in numerous events that contribute to the development of the discipline whether by giving large access to dance (Culture Days, International Dance Day) or through participating in events that are rethinking how to create and present dance (Short and Sweet by the company Wants and Needs, La 2e Porte à Gauche projects such as The Art (prononcez dehors) or Danse à 10). The company is a member of the Regroupement québécois de la danse and of La danse sur les routes du Québec. Finally, since 2005, the company has given more than 125 ateliers to people of all ages, in schools and for amateurs.